We love this effortlessly cool two piece. Made in lightweight, super comfortable cotton jersey, the skateboarding theme gives it a real summer style. Relaxed and casual, and with a drawstring waist, it's going to be any skater boy's summer wardrobe. It's a really suave outfit that's guaranteed to look amazing either dressed up or down - perfect for those summer barbecues. Both pieces are amazingly versatile, so they'll look great either paired together or with anything else you choose to style them with. 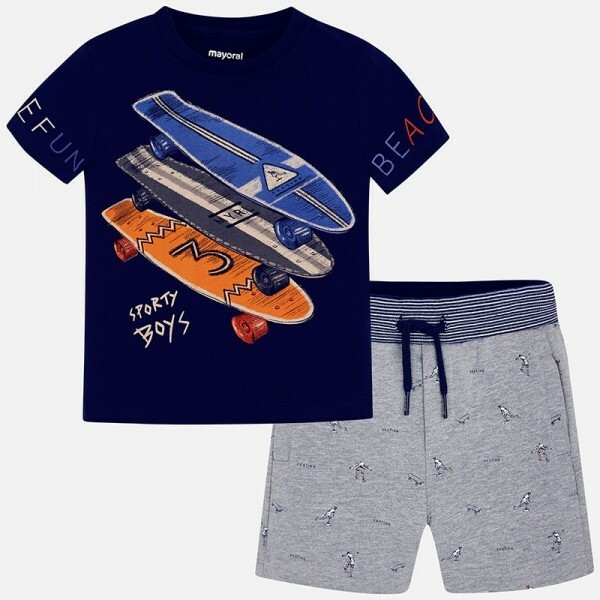 It's a great summer look - the skateboard theme moves perfectly with the tones of the summer.